To get to market faster, some HCI solutions traded performance for simplicity, leaving them inadequate for mission-critical and mixed workloads. In response to that performance deficit, many organizations have limited HCI deployments to a few targeted apps—but by doing so they’re not achieving the efficiency gains of converging infrastructure in the first place. 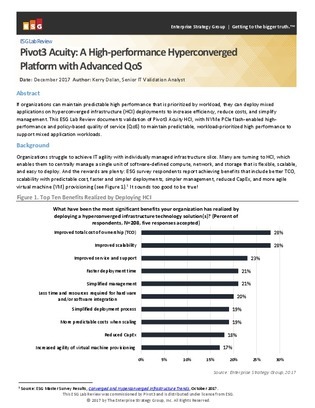 To resolve these issues, this ESG Lab resource reviews Pivot3 Acuity HCI, which features NVMe PCIe flash and policy-based quality of service to maintain predictable high performance for mixed-application workloads. Read on to see the results of this HCI solution tested on the likes of VDI and database workloads.